The celebration began on Saturday, June 13th, with a Vespers service. Present at the service were His Grace Bishop Dr. Mitrophan and the local clergy, V. Rev. Vasilije Sokolovic, retired priest from Saint Sava Cathedral, V. Rev. Steven Calos from the Greek Orthodox Church, Cleveland Heights, V. Rev. Rade Merick, from the Holy Resurrection Serbian Orthodox Church in Stubenville, Oh, Rev. Alex Pavicevich from the Serbian Orthodox Church in Lorain, Oh, V. Rev. Ilija Merzev from the Russian Orthodox Church in Cleveland, Oh, Fr. Vladimir Demshuk from the Serbian Orthodox Church in Clierton, Pa, and Rev. Zivojin Jakovljevic, from Saint Sava Serbian Orthodox Cathedral in Cleveland, Oh. Choir Negos did the responses under the direction of Milan Damljanovic. Following the dinner, Church folklore groups "Srbija", lead by its coordinators, Millie Patiarevic, Zlata Kozul, Kristina Obrenic, Bozo Lemajic, and Danijela Orabovic performed a number of Serbian dances, followed by a Serbian folk songs accompanied by gusle by Vukasin Mrkajic . The choirs Kosovo, lead by Dr. Stevan Zivic, and the Choir Njegos, lead by Milan Damljanovic, gave a concert of church and secular music. After the concert the program resumed with a dance accompanied by local orchestra of Simo Petkovic. The next day, on Sunday June 14th, Divine Liturgy was served by His Eminence Metropolitan Christopher, Bishop Dr. Mitrophan, Bishop Longin, and Bishop Dr. Maxim with the assistance of the local clergy, V. Rev. Vasilije Sokolovic, from Saint Sava Serbian Orthodox Cathedral in Cleveland,Oh, V. Rev. Petar Burlakov from Saint Sergius Russian Orthodox Church in Cleveland,Oh, V. Rev. Petar Selenoi, also from Saint Sergius Russian Orthodox Church in Cleveland, Oh, V. Rev. Rade Merick from the Holy Resurrection Serbian Orthodox Church in Stubenville,OH, Rev. Vladislav Radujkovic, from Saint Sava Serbian Orthodox Cathedral in New York City, NY, Rev. Isak Kisin from the Serbian Orthodox Church of Saint Steven of Dechani, Columbus, OH, Deacon Dragoslav Kosic from Mars, Pa, and Protodeacon Pavle Starcevic, from the Third Lake, Il. 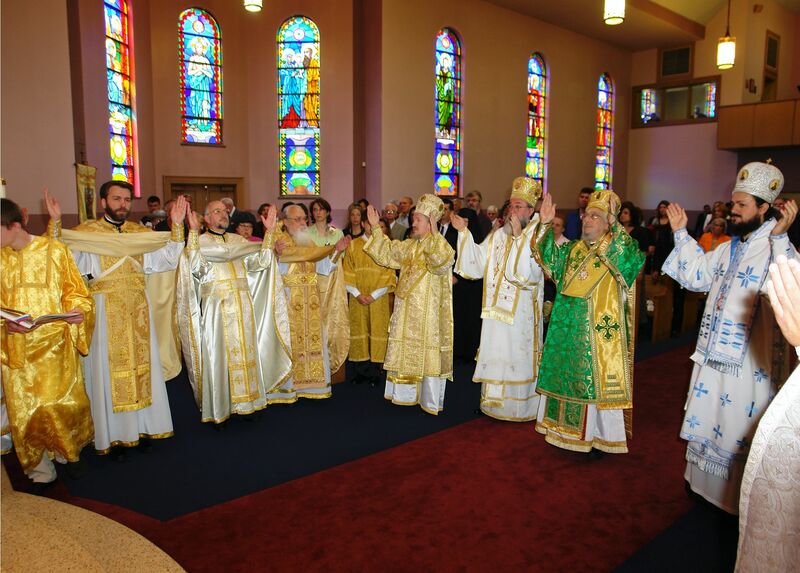 For his pastoral work, as well as for the diligence that he showed as the Director of Shadeland Camp, during the Divine Liturgy, His Grace Bishop Dr. Mitrophan elevated Rev. Zivojin Jakovljevic of Saint Sava Cathedral of Ceveland, to the rank of protopresvyter. The service was well attended by the faithful from Cleveland and vicinity. The Liturgy was beautified by the voices of Njegos Choir members and the very talented director Milan Damljanovic. In his sermon, His Eminence Metropolitan Christopher, addressed the faithful, in which he emphasized the importance of following the footsteps of the holy ancestors. In addition, His Eminence called the faithful of Cleveland to always maintain unity and love amongst each other. He praised the work and the effort that was invested in establishing and sustaining the parish, in spite of many difficulties and hardships. After the Divine Liturgy a Banquet was served. After the lunch Congressman Denis Kucinic greeted the faithful and thank the congregation for the invitation. In his address, he congratulated the parish on the celebration of the 100th anniversary, and recognized the importance that Saint Sava parish has for the city of Cleveland. This proclamation will be read at the US House of Representatives. In turn His Eminence Metropolitan Christopher expressed his gratefulness to the Congressman for his diligence in defending the truth, for which the Serbs have always stood. Bishop Longin in, His address, expressed His joy to see so many faithful present and emphasized the importance of mutual love and understanding. 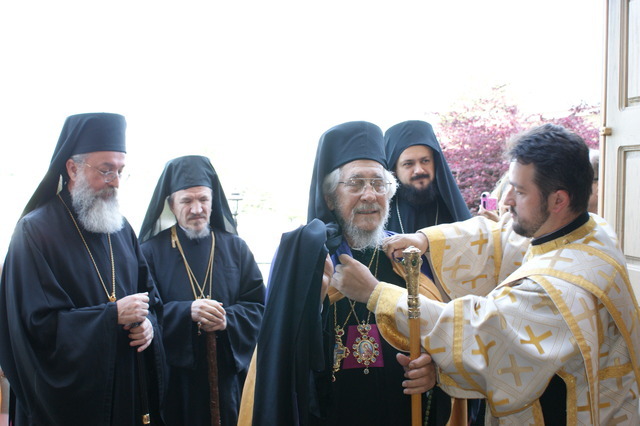 Bishop Mitrophan handed a number of Bishop's recognitions to the most deserving parishioners, who distinguished themselves in faith and devotion to our Holy Orthodox Church. Among the guests were the President of Serbian National Federation, Peter Borkovich, and the President of the Serbian Singing Society, Mary Pajich, who congratulated the parish of Saint Sava on its centennial celebration. In conclusion, it is necessary to express thank you to our Lord and Savior Jesus Christ, who guided and lead our people in the times of difficulty and tribulations. Who helped them to start a new life and build a splendid house of prayer for God's glory here in Cleveland.May He grant repose to the deceased donors and benefactors of our Holy Church, and may He grant that our younger generations emulate their holy example, by keeping the faith and the Lord's teaching. For indeed, as Holy Nikolaj Velimirovic proclaims, if we guard and preserve the faith, the same faith will in turn, guard and preserve us.